This is one of our most versatile combinations, perfect for home or hobby needs. We start with a 376 Self-Centering Extra-Wide Opening Head, we include the 300 Standard Base, and finish off with the 312 Parts Tray Base Mount. 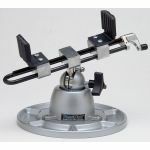 The 350 Multi-Purpose Work Center stands 7 7/8" (200mm) tall and weighs 5lbs. (2.3kgs).